Our masthead for this newsletter features a photo of President René Siracusa and artist Charles "Chuck" Snyder holding the new Malama O Puna sign. Chuck traded the sign for his membership. Before he added the text, he entered it in the juried 2007 Trash Art Show and it was accepted. The sign is painted on an old door with paints left behind at the transfer station, and thus meets the criteria of being recycled art. It is also very beautiful and evocative of misty mornings along the Puna coast. It is now our official sign that will accompany us to community events, where you will be able to see it in person. Mahalo Chuck. Wai‘ele: We wrote about this very special place in our "Caring for our Land" column, nominated it to the County’s Public Access, Open Space and Natural Resources Preservation Commission, and testified in favor of the County’s acquisition of this parcel. Emily NaeÔole sponsored the resolution, the County Council passed it, and purchase is now being negotiated. The parcel totals 165 acres with 2,000 feet of shoreline. Among Wai‘ele’s sacred treasures are some of the tallest coconut trees in Hawai’i, fresh water springs, rare groves of kukui, hau and hala trees, an ancient pohaku (stone) trail, the endangered Ôio (Hawaiian hawk) and ‘ope‘ape‘a (Hawaiian bat), the rare pueo (Hawaiian owl), and ancient Hawaiian burial sites. Puna Community Development Plan: We attended many of the earlier meetings and submitted our suggestions. Later, as brainstorming took place in cyber space, we added helpful information and our own mana‘o. The plan has a very strong bias toward environmental preservation. Upzoning Moratoriums Until Completion of Community Development Plans: We testified at the County Council in favor for Kona and Kohala and, at the same time, requested that the same be done for Puna. That resolution was proposed officially later in the year and we testified in favor. The moratoriums for all three districts passed the County Council. Ka‘u Preservation: We supported Ka‘u Preservation’s efforts to protect the area from development and convince the County Council to put it on their acquisition list. We testified in favor and collected many signatures. Pahoa Tranfer Station and Roadside Dumping: We continued to provide the County Dept. of Environmental Management with suggestions to improve the service and reduce/eliminate roadside dumping. There is better recycling now and an area for large appliances. We also have their commitment to clean the roadside before and after the holiday closures of Thanksgiving, Christmas and New Years. Signage has also improved. DLNR Hearings on State Forest Reserve System: Rene attended the hearings on proposed additions to the system. Wao Kele was one of them. Our concerns were addressed. SB1066: We submitted testimony in favor of adding a small fee for incoming marine cargo to help defray the costs of increasing inspections to keep out new invasive species. Gov. Lingle vetoed it but the Legislature overrode her. The Conservation Council of Hawai’i will propose a similar bill for air cargo, which we will endorse. Prevention is cheaper and more effective than fighting an established invasive. Puna Trail Historic Corridor: We submitted supporting testimony to place this on the National Historic Register which runs through the Government Beach Road mango grove and its historic rock walls. "Ice" House Rules: State DOH is in the process of promulgating administrative rules for decontamination and cleanup of "ice" manufacturing sites. Rene testified and offered a suggestion. This is our kuleana because "ice" contamination is hazardous waste. Miconia in the Nanawale Forest Reserve: Under the leadership of our Vice-President and Invasive Species Coordinator, Dr. Ann Kobsa, our crews went out on seven workdays to eradicate miconia. Coqui: We completed the lime voucher program that we had initiated with the help of a USDA grant. We had purchased 258 fifty lb. bags of lime and gave them away to individuals who were not eligible to receive help from other sources. Mangroves in the Wai ‘Opae MLCD: Ann Kobsa and friends did a lot of uprooting of over 800 seedlings plus killed 125 mature trees. Pahoa Beautification: With some funding for large, green plastic flower pots from Pahoa Weed & Seed (Act 40), donations of soil and cinder from Pahoa Hardware and Pahoa Feed and Fertilizer, and the willing little hands of our Pahoa Elementary students, we set out plantings along Pahoa Village Road from the Post Office to Pahoa Puna Buy & Sell. These were repeatedly vandalized and repeatedly replaced by us. That pattern continues. We refuse to be discouraged or intimidated. Several businesses caught the spirit and have added their own planters (Puna Style and Pahoa Village Cafe), while others have tended theirs (Sirius Cafe). We thank them. Landscaping at the Pahoa Neighborhood Facility: County Parks & Rec did a major renovation of the community center, and when they were pau many of the large Monkeypod and Australian Toon trees were gone. We offered to landscape the grounds and they accepted. We kept it simple but colorful, repeating the theme of Manila and Clumping Fishtail Palms already in the parking lot and adding some colorful vireya rhododendrons, thanks to donations from the Hawai’i Chapter of the American Rhododendron Society. Some of them have already started blooming. Caring for our Land: We produced 12 months columns for the Puna News on various environmental topics. If you missed them, check out our website. malamaopuna.org. : We are proud of our website that was designed and is maintained by our Secretary, Sherry Kelso. 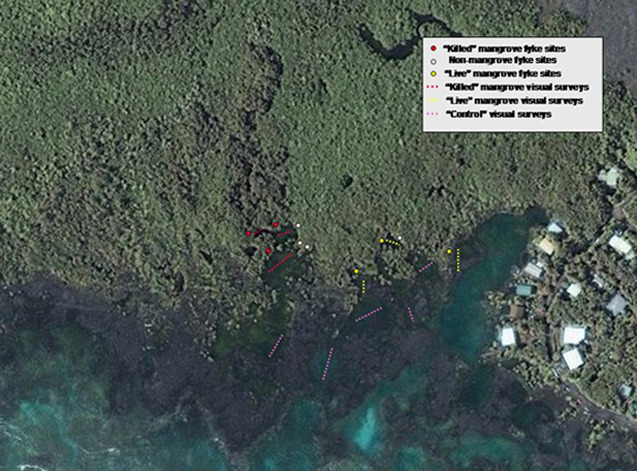 In addition to all the great information there are also handy links to other sites containing biological data and environmental materials, such as Friends of Hakalau Forest National Wildlife Refuge. It gets updated on a regular basis, so if you haven’t looked at it for a while, we suggest you do so. Veteran Big Island reporter Hunter Bishop liked our site so much that he put a link to it on his blog. B.I.Weekly article on Wao Kele O Puna: Rene took reporter Amanda Spauer on a visit into the forest for an article she was writing, and provided her with a lot of historical information that was included in the article. Displays at Town Meeting: Emily Nae‘ole organized this event on 9/22 to inform the Puna public about programs, projects and services available to our community. We had a booth with a Jr. Life Saving Program display and also a display about our beautification work. Friends of Hakalau Forest National Wildlife Refuge: The reserve is located above the Saddle and provides habitat for many of our endangered forest birds. The Friends group will support Forest Service efforts to restore the upland koa forest habitat, and we supported the Friends until they could get their own nonprofit status and their first $5,000 grant. Now our nestling has fledged, and we are proud that we were able to help. PHIS Campus Security Project: After several occurrences of after-hours vandalism, the school asked then-councilman Safarik for $28,000 of his discretionary funds to purchase and install security cameras. To save time, we were asked to act as fiscal agent. We agreed, the cameras were installed, the staff trained in their use and the principal is happy. Pahoa Springtime Jamm: For the fifth year in a row we acted as fiscal agent for this annual street fair, handed out educational materials, did some membership outreach and sold plants and our original design tee shirts from our booth. Jr. Life Saving Program: This free program run by volunteer lifeguards with Mark Franklin coordinating, for at-risk youth ages 8 to 18, consists of Fall, Winter and Spring Sessions. MOP wrote the funding grants to provide healthy lunches and RenŽ prepared the lunches. 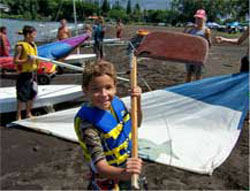 Classes included use of life saving equipment, CPR, mouth-to-mouth resuscitation, Heimlich Maneuver, accident assessment techniques, coastal environment, civic responsibility, Hawaiian values and canoe paddling, sailing and life saving techniques. Although we were very active in many areas this past year, as you’ll notice in the items above, our primary thrust and energy was involved in planning and fundraising for some important major projects that we will be doing in the year to come. The planning involved research, seeking collaborative partners, lots of meetings and written communication and intense grantwriting. Both projects involve control or eradication of invasive plant species, one mauka and one makai. MAUKA: The Wao Kele O Puna is the largest lowland (as opposed to coastal) rainforest in the United States, at over 27,000 acres. It starts at 1,200 feet elevation and 4 miles mauka of Pahoa. It is the watershed that charges the Puna aquifer. But it is much more than that. The Wao Kele is home to several plant and animal species that are rare or endangered. It was traditionally used by native Hawaiian gatherers for natural materials to make canoes, medicines, structures, clothing and personal adornment, etc. It is home to the goddess Pele and is therefore a sacred site. In the 1980’s the State of Hawai’i traded the Wao Kele, which was at the time a Natural Area Reserve, with forested land near Volcano for the purpose of geothermal development. 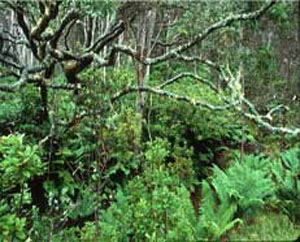 The Wao Kele had much more acreage, but it was claimed that the mauka forest was more pristine (even though no thorough studies had been done). DLNR issued a permit to Wyoming-based True Geothermal to allow a road to be built into the forest, cutting a swath over 3 miles long into itÕs heart. The State supported the drilling because they expected big royalties. They claimed that the terms of the permit would mitigate any negative impacts, but, as it turned out, they were unwilling to enforce these terms. Native Hawaiians and environmentalists organized strong opposition (the Pele Defense Fund, spearheaded by the charismatic Palikapu Dedman, and the Big Island Rainforest Action Group), and one of the largest protests in the history of the State resulted in 140 peaceful protestors being arrested so that the issue could get media attention. True brought in loads of material to build their road and lots of heavy equipment. 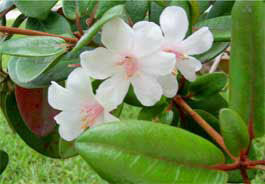 These imported the seeds of invasive alien plants deep into the forest. They bulldozed several acres more than their permit allowed and got a slap on the wrist. They destroyed an ahu. They dumped their hazardous materials on private property within the bounds of Pahoa village. They put up a high fence with barbed wire to keep the native Hawaiians from exercising their traditional gathering rights. And they failed to "monitor and control the spread of invasive weeds along the access road" for the first 18 months as required by their permit. But the weeds already had a strong foothold by then and their control efforts were half-hearted. Eventually the project failed and True left. The State excused them from the requirement that they restore the forest and return it to its original state, because they wanted to find another developer. That effort failed too. DLNR was then tasked with weed control, but without funding and staff this didn’t happen. With over 200 inches of rain a year, the weeds spread and continue to do so. Now, due to the efforts of Palikapu Dedman, OHA, the Trust for Public Land, and many others, the forest belongs to OHA. OHA and DLNR have an agreement to work together for ten years to create and implement a long range management plan and hire the necessary personnel. That will take another year. The weeds keep spreading and choking out the native vegetation. We worked hard on a grant proposal to OHA to get the $32,000 funding and permission so that we can stem the tide of the infestation during this interim period. In December 2007 OHA gave us the OK. The funds will cover supplies, equipment rental and a chipper truck contract. The people of Puna will be asked to volunteer their labor. We plan to involve the children and youth in control of the smaller weeds, and at the same time educate them about the natural and cultural importance of the forest, and explain why they should malama it. Later, with a more age-appropriate presentation, we will invite various community groups, Hawaiian civic clubs, etc. to take part. Please think about how you can take part in this important project. Are you involved with groups or organizations that you can interest in this? Do you have a pickup truck we can use? Can you treat the volunteers to cold bottled water? The Wao Kele has been locked behind a gate for many years and the people of Puna have been locked out and unable to experience its special uniqueness. HereÕs your chance to do so and at the same time to give back to the aina. MAKAI: The Wai ‘Opae tide pools fronting the Vacationland subdivision south of the peach-colored house are a very special place. Their ecosystem has been studied for many years by the UH-Hilo marine science program and their coral gardens attract snorkelers. They act as a fish nursery for the native fish that supply our local Puna fishery. Years ago we became involved with an ad hoc group composed of neighboring residents, environmentalists, fishermen, educators, native Hawaiians and DLNR-Division of Aquatic Resources to get the tide pools the protective designation of a Marine Life Conservation District (MLCD). Harry Kim was our Chair. We held several town meetings to get community input and eventually presented the request to the State Legislature. It passed! Now the tide pools are protected, but they are faced with several threats: illegal nighttime aquarium collectors, leaching of effluent from local cesspools (we’re working on that one too) and infestation by invasive mangroves. The mangrove propagules (seeds) float in on the tide, root on the coral and grow into trees that seed prolifically. Their presence can affect the water chemistry to the point where the whole ecosystem will be altered: coral gardens will become a mangrove swamp, water clarity will be reduced, native fish species will leave or die out and alien species will become established. For the last three years, Dr. Ann Kobsa and some of our Board members and their friends have been doing manual mangrove control, but we can’t keep up with the pace of infestation. So this past year we worked on submitting grant proposals so that we could purchase the necessary supplies and equipment to increase our efforts and even expand them to the seed sources outside of the tide pools. Hawai’i Tourism Authority has just awarded us a Natural Resource grant of $40,000. We have also applied for a NOAA Seagrant of $50,000 and are working with the Fish and Wildlife Service to put together another funding package. We have support letters from Bob Nishimoto of DLNR-DAR, Mayor Kim and neighboring property owners. Please consider volunteering for this project to help protect a very beautiful and special place. You can call the office at 965-2000 for more information about getting involved. Mahalo.